Apparently my last post caused some confusion. A couple of people wrote to say that they didn’t understand why the original graph wasn’t knit-able. I’ll try to explain again. One principle of lacy and other texture knitting is the equivalence of decreases and increases. In patterns with parallel edges, for every new stitch introduced into a row via a YO, Make 1 or cast on, there is an equivalent stitch removed by a complementing decrease. That decrease can come in many forms – a K2tog, a SSK, a cast-off, or as part of a multiple stitch decrease (Sl-K2tog-PSSO, K3tog, SSSSK, etc.) Yes, there are some exceptions – patterns that deviate by having a decreased stitch count on one or more rows, but if they have parallel edges, they must restore the stitch count on subsequent rows. I’ve graphed both types here before. By contrast, her Starlight Lace Stitch is a parallel edge insertion that has a modified stitch count on rows 16 and 14, that is restored in both places on the next right-side pattern row. The presence of those evil gray “no stitch” boxes is a dead give-away that stitch count monkeying has happened. To create a panel with one or more decorative edges – edges that zig in and out to make nifty curves, scallops, or sawtooth or triangle points – the stitch count has to be deliberately altered so that the width of the piece grows and then shrinks in a predictable manner. Most of these decorative panels are edgings – strips with one nice firm straight edge that is usually knit or sewn onto the thing being trimmed, and one fantastical dagged edge – the decorative points or ruffles that hang free. There are two-edged edgings that in the past were used as trim or decorative strips all by themselves – lingerie straps, camouflage for shelf edges, free strips appliqued onto towels and house linen, but they’re far less common and are rarely seen in modern pattern collections. The stitches introduced (or decreased) to form the points can occur anywhere in a row. Placement as well as the number helps determine the overall shape and depth of the point. If the new stitches accumulate or disappear from the left of the location of increase/decrease, the points tend to be a bit sharper. If they accumulate between the stable edge and the location of the increase/decrease the points formed are more like waves or scallops. We saw that in the pattern I charted in the last post, where the point-forming increases/decreases were relatively close to the stable right edge of the piece, stitches were accumulated between the stable right edge and the location of increase decrease, and that spot was followed by a relatively large section that had a stable stitch count. 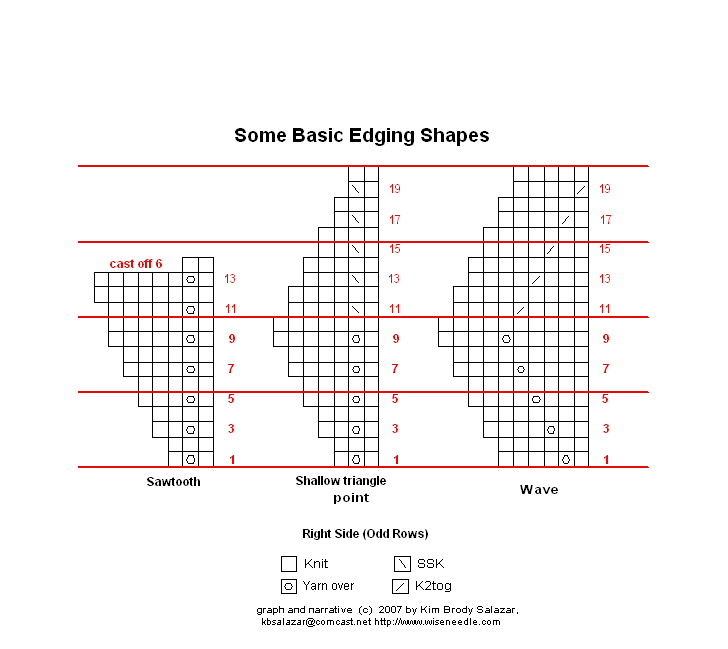 Here are simple graphs of a few basic edging shapes, stripped of all lace detail. Note that in each and every one, if a row has more (or fewer) stitches than the one that preceded it, there is a clearly discernible cause on that preceding row – an increase or a decrease that’s clearly to blame. Yes, the graph looks good. The points march in and out in clearly defined order – but the causes for that patterning are absent. Every YO on this graph is countered by a decrease. There are none left over to form the basic triangle point shape. Now as to why the chart was published this way – the pattern book I was working from is a direct facsimile of a work produced in Germany in 1921, in a language I can’t read. I did double check the instructions, both against the English key thoughtfully provided by the book’s modern editors; and against the original diagrams presented at the front of the book. Those show standard symbols and a little engraving of what the resulting work should look like. I also successfully reproduced another pattern on the page that uses the same symbols, so I’m pretty sure that in spite of not being able to read the accompanying text I didn’t miss anything substantive. My guess is that because charting was new, and the symbols used in the original book are not standard (charting symbols aren’t standard even today), among the pattern designers, the artist that laid out the pattern, the typesetter, and the proofer, errors slipped in. Proofing knitting patterns isn’t an easy thing, as any modern professional pattern writer/editor can tell you. In my experience, the most accurate patterns appear to have been produced between 1950 and arbitrarily – 1985. Stuff before in general isn’t as stitch for stitch perfect or isn’t in modern notation; and stuff after seems to have suffered from a lack of skilled manpower and/or editorial time. Not to say everything published after 1985 is junk, but we’ve all seen books rushed to market that required dozens of pages of errata. Books published during the designated “sweet spot of knitting” era tended to require far fewer corrections than do many contemporary works. Kudos to those professional authors/editors/publishers who have taken on the extra time and expense in pursuit of perfection. Eyebrows are raised at those who cut corners. Slack is cut for pre-modern works, especially those that pioneered new forms of instruction. Afterword: People new to charting might find the Charting 101-107 series here on String useful. You can find those posts under my Reference Shelf tag. I don’t have the Lacis book, but an original 1921 copy in which the accompanying text instructs you to work even rows 2-16: yo, k to end with k1p1 in double yo. Even rows 18-32: k2tog, k to end with k1p1 in double yo.